Since that first Endurance ride, Hanna’s accumulated 1,265 Endurance miles, including numerous FEI rides. She has seven first place finishes, two best condition awards, and completions in 23 out of her 25 rides. Hanna’s first FEI ride was the Greenway Getaway in Dunnellon, Florida. She rode the 50 on Meg’s horse Syrocco Rabia (Rabi). She completed a 50-mile ride the day before on Syrocco Harmony (Harmon) as well. Of her 11 FEI rides, she completed nine of them, and was first in six of them. She’s competed throughout the East Coast, in Kentucky, and Ontario, Canada. I asked Hanna about the hardest part of Endurance. “To be completely honest, getting up at 3:30 or 4:00 in the morning is the hardest part. Once you get past that, 75 miles is cake,” she jokingly says. Hanna continues to ride with Meg, and competes several of her horses, and perseverance has paid off for her. In 2014 she rode Rabi in the North American Young Rider Championship (NAYRC) and won the individual silver medal. Then, she rode Valerie Kanavy’s horse Gold Bandit to an individual gold medal finish in the young rider division at the 2015 North American Endurance Team Challenge (NAETC). Gomez is still in the picture too. Hanna competes him in Dressage and limited distance rides. Her future goals are to represent the United States at a world competition, perhaps the FEI World Equestrian Games or the Young Rider World Endurance Championship. Hanna also knows how busy life gets, and says that as she gets older, her goal is to have a schedule that allows her to continue riding. “Riding FEI Endurance has done so much for me,” Hanna concludes. “It has allowed me to travel to other states and countries to ride or support the country’s top riders. 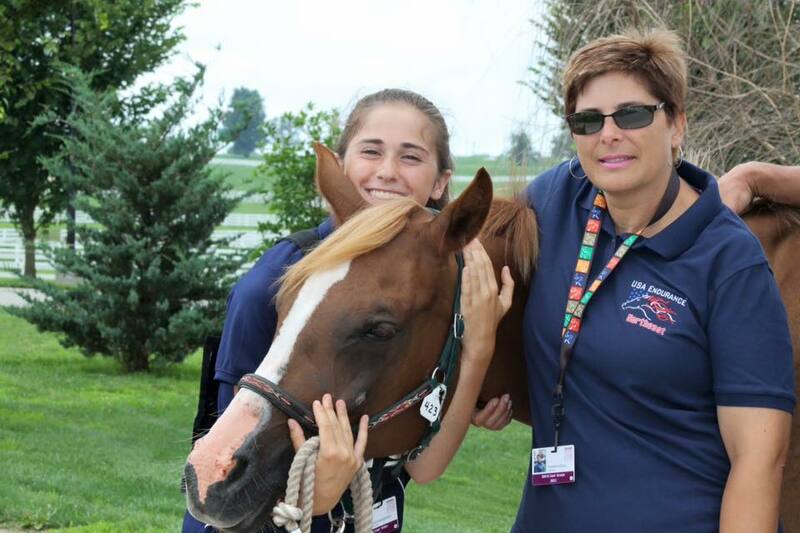 “I had the amazing opportunity to go to France for the World Equestrian Games in 2014 and support our riders. I have been able to travel up and down the east coast and visit places I never thought I would. “I have built a network of friends that share the same love for horses that I do. I was able to ride at the NAJYRC in 2014 and in Canada at NAETC in 2015. Without the network FEI has given me, I would not have had the chance to experience all of these amazing things.